In the world of consumerism, we know that competition is good. When companies in any industry compete for their piece of the market share, it usually means more options for consumers, and at competitive prices. That being said, what happens when companies merge, going from two companies to one? That’s a question the world’s top two brewers, Anheuser-Busch InBev and SABMiller, have to answer after they announced their plans for merger last month. What does this mean for the beverage distribution industry and consumers? Read on. Anheuser-Busch InBev is a publicly traded company based in Belgium. Their portfolio contains over 200 brands of beer, with notable brewing giants Budweiser, Corona, Stella Artois, Beck’s, Modelo, and Michelob Ultra. The company, who also has ties to PepsiCo, has 155,000 employees in 25 countries worldwide, and 2014 revenue was $47.1 billion. SABMiller is headquartered in London and is also publicly held. It’s the world’s second-largest brewer (after AB InBev) and also bottles Coca-Cola. 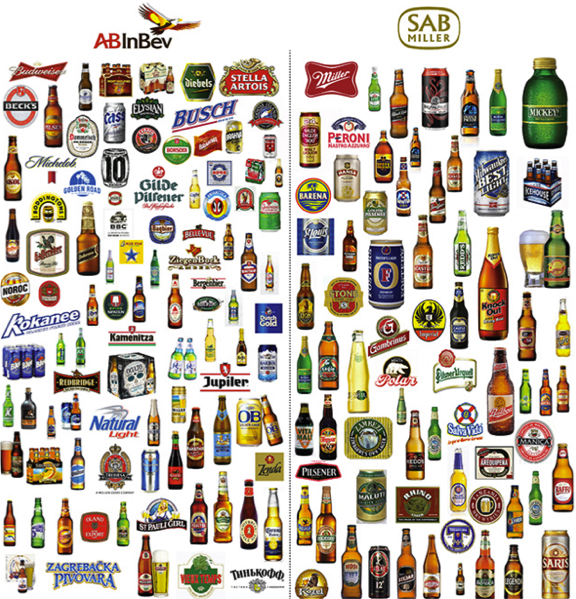 Its brand portfolio also has over 200 labels including notables Miller, Fosters, Grolsch, Peroni, and Pilsner Urquell. They have 69,000 employees in 80 countries. The company’s revenue last year was $26.3 billion. SABMiller’s two biggest shareholders, cigarette-maker Altria and the Santo Domingo family of Columbia, own 41 percent together. By marrying these two brewing giants, the result would be a combined global production of a third of world’s beer, dwarfing other major producers like Heineken and Carlsberg. The merger still faces approval by regulators. While these brands are global, the merger is expected to have repercussions for the rest of the industry, particularly in the U.S. where the two companies would control 70 percent of the beer market, unless they sell off some assets. SABMiller gets a bit more complicated in the U.S. by their joint venture with Canada’s Molson Coors. That venture, called MillerCoors, sells brands including Coors Light and Miller Lite, and is the second-largest brewer in the U.S. So while the acquisition is in pending processes and the affect on our country isn’t at all solidified, a lot of opinion says it’ll stay widely global affecting Africa and China, for example, more than our soil. Regarding distribution relating to Minnesota, beer franchise laws protect the agreements for distribution. A brewery should become familiar with state laws that regulate brewer-wholesale relationships. Speaking of breweries, should the 3,418 microbreweries in the U.S. worry about the impending conglomeration? Not necessarily. One thing is for certain. At Bernick’s, we care about people, the community, and quality brands of food and beverage. We’ll remain committed to those principles and responsive to any change our industry affects. We’ll keep you posted regarding all things beer – just remember to stay connected.